The planned general strike for later today, 10 December is still scheduled to go ahead, but unions bowed to the government and called off protest marches amidst Greece's worst rioting in decades. 2.5 million workers in the GSEE and ADEDY general unions, comprising around half of Greece's total workforce are to strike today. They are demanding an end to cuts in public spending and attacks on pay and pensions. Greece's transport network in particular is set to grind to a halt, as many airlines have already cancelled all flights in and out of the country. Tens of thousands of workers are expected to pour into the streets, already ravaged by days of clashes over the murder of a teenage boy by police. Yet the two mayor union federations did not agree in postponing the general strike, they accepted to play their part in calming down the situation. The initially scheduled demonstration was cancelled by the unions and substituted with a static manifestation close to the parliament. It's good to get involved in libcom. Greece and round the world... things are hotting up... and it's not a moment to soon. But over twenty years or so i've started to move away from anarchism. Too often the anarchist movement seems to settle for little - for a riot, a stone and a molotov cocktail. Nothing seems to have changed in the anarchist milieu since the 1980s. But we want more than that don't we? We want the power to put this rotting sytsem to bed for good. Or do we just want a fight with the police? The anarchists lack ambition. From what I can see in Greece you have a classic pincer movement on the idea of working class power. On the one hand you have the "heroes" all tooled up and thinking the revolution comes at the arc of a rock. On the other hand you have the trades unions who want to march and appeal for a fairer deal. But most working class people will not be attracted by the sight of a riot - they have kids to feed and bills to pay. But any revolutionary potential they do have is syphoned off into the meaningless march around town and in trusting in our "Labour" leaders to secure a "fair deal". Both courses are a revolutionary dead end. All revolutionaries should be "raising the property question" - arguing for working class power and the end of capitalist social relations. That is the task of the hour. I don't think a fight with the police on its own develops a revolutionary consciousness... why do you think football fans are involved!? Come on anarchists! We have a world to win. Let's get ambitious! Damien I couldn't agree more. 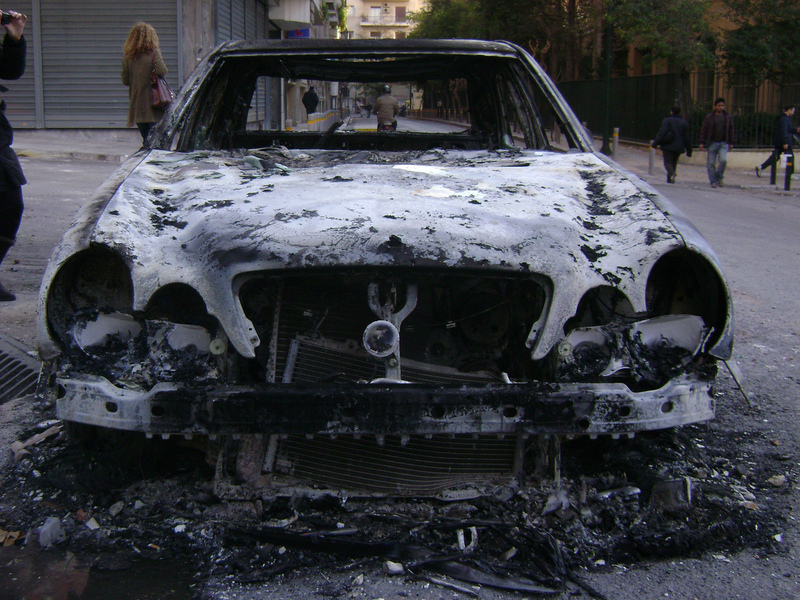 The work of the rioters and protesters have opened up, specifically in Athens, it seems, areas of the city such as the polytechnic university that could be used for meetings, printing, even the possible setting up of collectives, you were totally correct Damien in saying "we have a world to win". It's a point worth considering that the stand offs with the police should only be a tool used to defend a glimpse of a new way of things that could be formed behind the barricades. So that all said, it'd be nice to hear what people on here think about how we can play a role in solidarity and communicating intellectually with our Greek counterparts.